Interested in camping at North Hero? Remote camping is available at the park. The ranger station is open on a reduced-hours schedule, although there is resident staff in the park around the clock. The fee is $5 per person per night rather than the usual cost per campsite. We hope you enjoy North Hero! Okie Dokie Baking is now serving delicious treats at Jamaica State Park! If you have a sweet tooth or just need some refueling after going for a hike or taking a swim, be sure to follow your nose to the baked goods table. We're glad the owner John Kurland decided to take up a place in Jamaica. John creates mouthwatering combinations of the best quality freshest ingredients using local fruit and vegetables, real butter, real milk, and real eggs- ingredients that are simple and authentic. All the pies, muffins, cakes and cookies are made by hand one at a time. John has a long history with baking, see a short description from his website of how he got his start below. Waste Not...Want to go Camping? Lake Champlain International and Vermont State Parks offers chance to win EarthSmart compostable meal kits by sharing photos of fun on Lake Champlain. Lake Champlain International (LCI), with their partner EarthSmart, has joined with Vermont State Parks to help you gear up for your next Lake Champlain outing! Beginning on September 1, 2011, go to either LCI’s Facebook page (facebook.com/LakeChamplain) or Vermont State Parks’ Facebook page (facebook.com/VTStateParks) and post your favorite photo of you or your family enjoying Lake Champlain at one of the many state parks. It can be a picture of fishing, camping, swimming, or anything else involving the lake. Be creative and show us how you use your lake and parks! 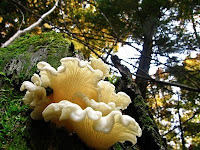 Throughout the state of Vermont, thousands of different species of fungi co-exist amongst us. Ranging in size from microscopic to very large, these organisms serve a multitude of purposes that, without their presence, would change the face of the world as we know it. As many of us know these unique life forms can be found in many of the items we encounter daily, from foods to medicines. Though, many forms of fungi can be harmful, even deadly, their presence is essential to maintain life on earth. Breaking down organic life forms, to become a part of the earth and soil, allows ecosystems to both grow and thrive, maintaining the beautiful places we all enjoy escaping to for recreation and general enjoyment. Jonas Rosenthal, the town manager of Poultney for over 25 years has another tough job, organizing and running the Lake St. Catherine State Park concession stand. This isn't an ordinary concession stand though; it's a unique opportunity for high school students to gain work experience. It all started six summers ago, when Jonas, who also runs an extensive summer recreation program for youth, heard alot of complaints from kids about wanting to work, but unable to find jobs. A request for proposal (RFP) came up for the concession stand and Jonas applied with the angle of a youth employment program. The selectboard approved with the stipulation that he could run the program as long as he didn't lose any money. Rocky Gives Two Thumbs Up to New Wilgus Cabins with Wifi! Park Ranger, Eric Hanson, jokes that when asked, the famous flying squirrels (which can be seen in the photo launching off of the Ranger's House chimney) give two thumbs up to the new cabins in Wilgus State Park. When pressed, he admits that they always give two thumbs up when flying off the roof. ﻿﻿Nonetheless, the beautiful new cabins, Eagle and Osprey, have just been opened and are ready for visitors. 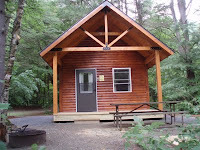 Similar to the cabins in other parks, Brighton, Button Bay, Gifford Woods, Grand Isle, Half Moon, Lake Carmi, Little River, and Ricker Pond, Wilgus' cabins offer room for up to four guests on bunk beds and a futon or sleeper couch. A table, two chairs, an electric outlet, a covered front porch, and outside fire ring with a cooking grate all come with it too. Fall migration is often an overlooked time of year for bird watching. It may be less intense than spring migration, but be assured, with all kinds of birds heading south from the boreal forests north of us, you are bound to see something special. In Vermont, fall birding is marked by warbler fallouts in woodlands and fields, spiraling raptors ascending mountain breezes, and waves of migrating waterbirds resting along the shores of our larger lakes. As my internship comes to an end, I can absolutely say that it was a great way to spend the summer. I was finally able to use summer as I think it is meant to be used, exploring different places and doing outdoor activities that are impossible other times of year like swimming in the many lakes of the state parks. This summer has kept me active and able to stay outdoors all the time, which was a big change from my technical institute where much of my time is spent indoors doing homework or projects. Vermont in the summer is a haven for doing the physical work for my internship, removing invasive species. I was glad to have cooler summer weather than southern New York and a surplus of beautiful scenery. I expanded my nature portfolio and took some great wildlife shots while learning. I especially learned a lot when it came to camping, since I had never really done any solo camping before. Game Night at Elmore State Park! Matt Cioni, Park Interpreter at Elmore State Park, knows how to have a good time. In addition to fun programs like hiking to Elmore's fire tower, the Jr. Ranger Experience, Nature Art, Soda Can Fishing, and concerts, Matt offers Friday Night Game Night! Check out the events page to see when things are happening. 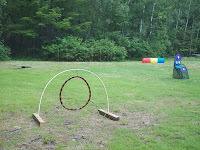 It's a great way to get out some energy, meet new friends, and have some fun. Go to the Beach House at 7pm on Fridays to join! Rain or shine and all ages are welcome. Elmore State Park, located on the shores of Lake Elmore in north central Vermont, has 45 tent/trailer sites and 15 lean-tos. Visitors have several hiking trails to Elmore Mountain and its fire tower nearby. The day use area includes a large sandy beach, a newly renovated historic CCC bathhouse with a concession stand and cafe, restrooms and a rental pavilion, a picnic shelter, numerous tables and grills, a pet-friendly picnic area, and row boat, canoe, and kayak rentals.